Last week HM and I had to go down the hill. 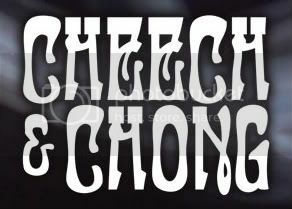 Earlier that am HM noticed that the infamous duo of Cheech & Chong were going to be performing at San Manuel Casino so while I was at my appointment he took off to the casino and when we reconnected, he had two tickets for the evening performance. I have to say that I’ve never been into the casino before. The first thing that stood out for me is the abundance of security personnel. When I took a look around it seemed that most of the crowd came in from the surrounding area. There were lots of black shirts, an abundance of tattoos, and an assorted collection of piercings. Funny, I was worried about the dress code and as I gazed around the crowd determined that there was nothing to worry about. In fact, I didn’t have any tattoos and wasn’t wearing dark clothing so I was a bit out of place. 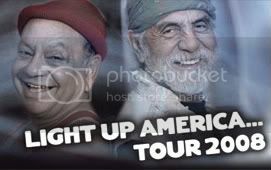 The event launched the newest segment of the Light Up America tour for the duo Cheech Marin and Tommy Chong. The two were very popular comedians where I grew up in Los Angeles County. Cheech happened to be one of the few Hispanic comedians at a time there weren’t many Latinos at the forefront of the entertainment industry. Most people remember their silly 1978 movie, Up In Smoke which was the highest grossing comedy of the year—bringing in more than $100 million at the box office. The duo (and most of the crowd) focused a lot on the topic of pot smoking and related activities. We laughed and laughed at many of the antics, although I found some of the routine was a bit too crass for me, most of the crowd was super enthusiastic. As for the venue, I probably won’t go back. First, the show started a half and hour late. The long lines for snacks and alcohol wrapped around the room and most of the seats were empty as a result until just about the time the show started. The layout of the chairs made it hard to see–and for the price I’d have liked to enjoy more beyond watching the big screens because I couldn’t see past the big burly guys in front of me. It wasn’t just me because I noticed that many people seemed to be craning their necks to get a view. Staggering the chairs in the rows or elevating the stage would have helped solve this issue. Also, the sound system wasn’t very good and when it was loud it was way too loud—I could have used earplugs. All in all, it was good to have a real date with HM and since the duo hadn’t been performing in a long, long time it was a treat. This entry was posted on Wednesday, November 5th, 2008 and is filed under Mountain Lake Resort.